3. 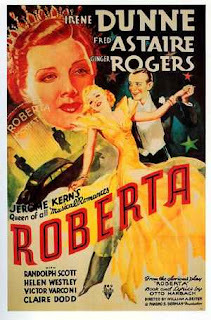 Roberta (1935): You'd think that it would have been obvious to everyone how well the Astaire-Rogers star pairing worked in The Gay Divorcée (1934), but for Roberta they were returned to supporting roles. The film was planned before The Gay Divorcée was released, so perhaps that explains the filmmakers' caution in falling back on the Flying Down to Rio formula. The movie was based on a Jerome Kern stage musical of the same title. As was the usual practice, several numbers from the stage show were cut, and new songs—"Lovely To Look At" and "I Won't Dance," also by Kern—were substituted. The lovely Irene Dunne gets top billing as Stephanie, the main designer at a glamorous Parisian boutique. When Roberta's owner dies and leaves the shop to her American nephew John Kent (Randolph Scott), he and Stephanie clash at first before they realize they can't live (or run a business) without each other. Stephanie and Kent are the serious romantic couple, and so Dunne doesn't get to give full play to the wonderfully wry comic persona she later displayed in movies like The Awful Truth (1937) and My Favorite Wife (1940). She does sing the Kern classics "Lovely to Look At" and "Smoke Gets In Your Eyes" in a high operatic soprano that, because it doesn't have a hint of jazz in it, sounds like it should be in a different film. The stolid Scott is typecast as an American lunk who gets in over his head in both business and love. 4. 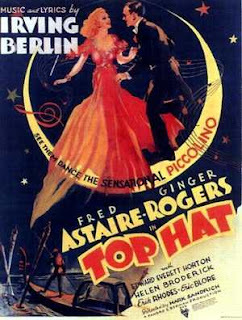 Top Hat (1935): This was the first of their films to be written specifically for Astaire and Rogers, but it essentially follows the model of The Gay Divorcée—initial antagonism and mistaken identity inevitably being overcome by love. Rogers plays Dale Tremont, friend of Madge Hardwick (Helen Broderick), wife of the theater producer Horace Hardwick (Edward Everett Horton), who is putting on a London show featuring the American song-and-dance man Jerry Travers (Astaire). Got all that? Dale comes to believe that Jerry is Horace, and so she is outraged by his romantic pursuit of her around London and all the way to Venice (or perhaps I should say "Venice," since no attempt is made to made the Venice locations look like anything other than the huge Art Deco film set that they are). And Dale is very puzzled by Madge's eager matchmaking between her and the man she thinks is Madge's husband. Of course, ultimately the confusion is cleared up, but not before Fred and Ginger sing and dance through some terrific Irving Berlin numbers written for the movie. I find the plot of Top Hat to be a bit too thin—is it really conceivable that Dale wouldn't realize her mistake almost immediately, or that she would so readily agree to marry the fop Bedini (Eric Rhodes, of course)?—but I realize that the plot is beside the point. Top Hat is delirious tongue-in-cheek fun, and it was a smash. It's still probably the movie people are most likely to be thinking of when they think of an Astaire-Rogers movie. Amazingly, though—in my humble opinion, at least—they still hadn't reached their peak. Nicely written. I agree with most of your observations. I am a bit surprised, however, that you did not even mention the delightful "I Won't Dance" number from Roberta. The singing interplay between Astaire and Rogers is delightful, and his solo is quite impressive. I didn't include "I Won't Dance" only because, after Ginger's entry, it becomes a solo dance showcase for Fred. In this series I'm focussing on their dances together. 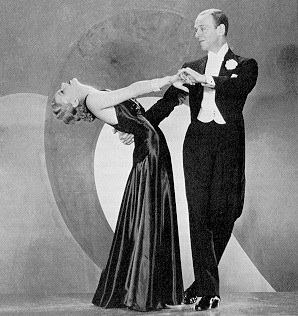 I'm trying to trace for myself (and interested readers) how the Astaire-Rogers partnership developed over their eight comedies together, especially as expressed in their dance duets. (And also to give a bit of a viewer's guide to the films.) For in-depth discussion of the films, their production backgrounds, and the individual numbers, Arlene Croce's book is a good place to begin.